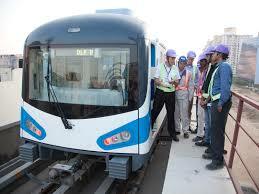 The second phase of Rapid Metro Rail Gurgaon was launched today by the Haryana Chief Minister, Manohar Lal Khattar. With Siemens acting as a lead contractor, the second phase of Gurgaon metro has been successfully completed. The minimum headway will be 270 seconds which will give a line capacity to carry about 30,000 passengers. Siemens has supplied seven three-car trains for the extension. Each train can accommodate up to 800 passengers. Siemens has also supplied its Sicas ECC type electronic interlocking, LZB 700M automatic train control with ATP/ATO, and its Vicos OC 501 ATS system. Phase I of the Rapid Metro Gurgaon has been in operation since November 2013 and connects Gurugram Cyber City with Sikanderpur and has a proven record of more than 99.88% punctuality. With the launch of Phase II, the connectivity has increased with additional 5 stops between Sikandarpur and DoubleTree Hotel in Sector 55/56. The southward extension of the Rapid Metro Rail will ease the commute to Golf Course and Golf Course Extension, greatly improving the poor connectivity in this rapidly growing commercial hub of the National Capital Region. “We at Siemens are happy to be an integral part of the improvement in Gurugram’s public transportation system through the second phase of the Rapid Metro. Mobility is an area of expertise for us and Siemens will continue to partner with infrastructure providers to help improve connectivity,” said Tilak Raj Seth, Executive Vice-President and Head, Mobility, Siemens Ltd.